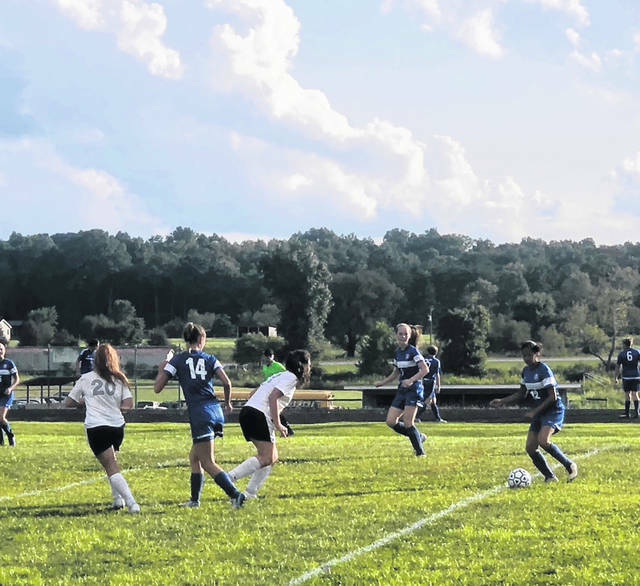 The Mohawks swept the Senators in their boys’/girls’ soccer double header in McDermott Thursday evening. Northwest to take on the Mohawks in a SOC matchup with much at stake early in the season. extending their lead to 2-0.
a misplaced touch resulted in an own goal. Northwest would enter half with a 3-0 lead. Minute, Reyes would find the back of the net for her third goal of the game, picking up a hat-trick and increasing her team’s lead to 4-0. With 24 minutes remaining in the match, Throckmorton would score a goal of her own with a shot creeping past the goalkeeper from close range to extend their lead to 5-0.
goal of the game and increasing their lead to 6-0. Ellie Curtis would join her teams scoring spree two minutes later with a goal on a breakaway late in the match, bringing Northwest’s total to seven goals. Senator sophomore Haven Hileman would line up for a free kick from eighteen yards out with three minutes remaining in Thursday’s contest. Hileman would sail a dart over the fully stretched goalkeeper, putting the Senators on the board 7-1. Senators following the girl’s win. Evan Throckmorton past the goalkeeper, giving his team the lead 1-0. Just minutes later, Throckmorton would strike again on a breakaway past three Senator defenders, keeping the shot on the ground and fooling the goalkeeper to find the net, extending their lead 2-0. Throckmorton would continue his dominant performance as he would complete the hat trick with 23 minutes left in the first half off a steal and quick crossover shot towards the goal giving his team the 3-0 lead. find the back of the net himself on a shot from fifteen yards out. Within the same minute, McClay scored again for his second goal of the game, giving the Mohawks a 5-0 advantage before the half. The second half would begin at slow pace until fifteen minutes in when Mohawk sophomore Eli Dunn would join his teams scoring outburst with a fifteen yard laser shot to extend theie lead to 6-0. The scoring wouldn’t stop there for Throckmorton and Northwest. With ten minutes left in the match, Evan outran two defenders and created an open shot that he would easily put away to go ahead 7-0. Just five minutes later, who else but Evan Throckmorton to finish the game off with his 6th goal off of a steal and shot finding the back of the net, giving his team the victory over the Senators, 8-0.
double header at home next Tuesday against the Waverly Tigers. https://www.portsmouth-dailytimes.com/wp-content/uploads/sites/28/2018/08/web1_nw-pic.jpegThe Mohawks swept the Senators in their boys’/girls’ soccer double header in McDermott Thursday evening.